In a motor accident, wherein a speeding car hits a slower moving vehicle coming from the side, the speeding car drivers often swear that they just didn’t see the vehicle coming from the left or right. Well, they aren’t lying. They really don’t see the vehicle coming from the side, in spite of broad daylight. This phenomenon on the car drivers’ part is known as “Motion Induced Blindness”. It is unbelievable but it is true, and it is definitely frightening. Armed forces pilots are taught about motion induced blindness during training, because it happens faster at high speeds; and to some extent it is applicable to car drivers also, especially the fast ones. So, if you drive a car, please read this carefully. Once airborne, pilots are taught to alternate their gaze between scanning the horizon and scanning their instrument panel, and never to fix their gaze for more than a couple of seconds on any single object. They are taught to continually keep their heads on a swivel and their eyes always moving. Because, if you fix your gaze on one object long enough while you yourself are in motion, your peripheral vision goes blind. That’s why it is called motion induced blindness. For fighter pilots, this is the only way to survive in air; not only during aerial combat, but from peacetime hazards like mid-air collisions as well. Let me give you a small demonstration of motion induced blindness. This is the same demonstration that is used for trainee pilots in classrooms before they even go near an aircraft. Just click on the link below. You will see a revolving array of blue crosses on a black background. 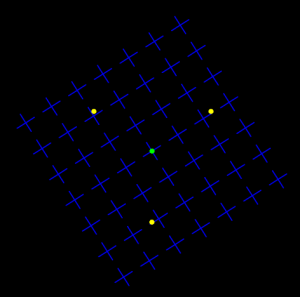 There is a flashing green dot in the centre and three fixed yellow dots around it. 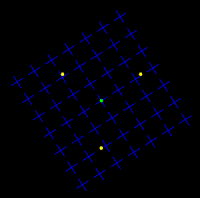 If you fix your gaze on the green dot for more than a few seconds, the yellow dots will disappear at random, either singly, or in pairs, or all three together. In reality, the yellow dots are always there. Just watch the yellow dots for some time to ensure that they don’t go anywhere! So, if you are driving at a high speed on a highway and if you fix your gaze on the road straight ahead, you will not see a car, a scooter, a buggy, a bicycle, a buffalo or even a human being approaching from the side. Now reverse the picture. If you are crossing a road on foot and you see a speeding car approaching. There’s a 90% chance that the driver isn’t seeing you, because his/her peripheral vision may be blind! And you may be in that blind zone!! Actually these kind of issues happen just because of the lack of awareness and lack of management by traffic controllers. Drivers should be trained before going to the roads about the rules of the traffic and roads.